Ross JW, Fernandez de Castro JP, Zhao J, Samuel M, Walters E, Rios C, Bray-Ward P, Jones BW, Marc RE, Wang W, Zhou L, Noel JM, McCall MA, Demarco PJ, Prather RS, Kaplan HJ. Invest Ophthalmol Vis Sci. 2012 Jan 31;53(1):501-7. DeMarco P.J., Prather R.S., Ross J.W., Walters E.M., McCall M.A., Kaplan H.J. 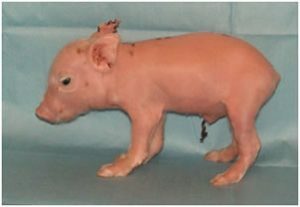 2010 Functional Assessment of a P23H Transgenic Swine Model of Retinitis Pigmentosa (RP). Association for Research in Vision and Opthamology. Fort Lauderdale, FL. May 2-6. Ross J.W., Zhao J., Walters E.M., Samuel M., Narfstrom K., Jeong M., DeMarco P.J., McCall M.A., Kaplan H.J., Prather R.S. 2009 Somatic cell nuclear transfer to create a miniature swine model of retinitis pigmentosa. Experimental Biology. New Orleans, LA. April 18-22.